The Walter Swan Trust has been established to promote creative writing and to provide opportunities to young and new writers. The charity's first planned activity is The Walter Swan Playwriting Award, in association with the Ilkley Playhouse and the Ilkley Literature Festival, and with the support of the West Yorkshire Playhouse. We hope this will become an annual event. Over time, the charity's activities will spread into other areas of creative writing. This includes plans to introduce a poetry writing competition in 2016 in association with the Wharfedale Poets. Initial funding has come from donations given at Walter's funeral on 2 May 2014 and subsequently we have continued to receive many generous donations. Various fundraising events are planned for the future. If you would like to donate, you may like to wait until Gift Aid status has been secured. Once this is in place, we will include a donation link on this website. 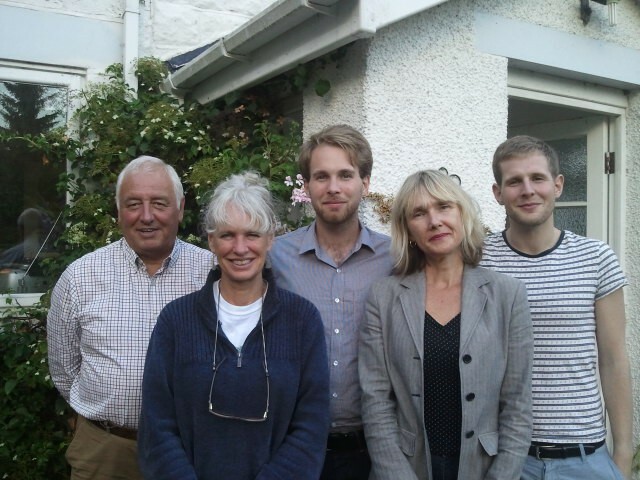 The founding trustees from left to right are Graham Smith, Niccola Swan (chair), Finlay Swan, Yvette Huddleston and Laurie Swan. The registered charity number is 1159121.